Update: PrimeSense updated me regarding redistribution of OpenNI/NITE on Twitter: “Commercial apps are allowed and they can be packaged with OpenNI/NITE.” Thank you! For my Kinect-hacking friends who missed last night’s “Evening With PrimeSense” meetup in NYC or otherwise have the misfortune of living elsewhere in the world, I thought I’d share some of the tastier morsels. Specifically, PrimeSense is interested in living room applications that it can pipe into, say, TVs or set-top boxes from manufacturers who integrate Kinect-like sensors. Shvueli discussed the potential of such sensors to offer novel content and user experiences as well as value to businesses, such as highly-targeted TV advertising (is the whole family present or just dad?) and performance metrics (are the viewers engaged with the content or doing something else?). The Kinect and Kinect hacks, he said, are the tip of the proverbial iceberg. PrimeSense wants to enlist the help of indie developers to “excavate” the whole thing. The pitch proved a bit too commercial for some in the 40-odd crowd. To overgeneralize, the NYC tech scene sometimes skews toward art and public interest applications, not commerce–developers tend to care about something other than keeping the pie pans of capitalism spinning, as one of my mentors might put it. And so, a contentious privacy discussion ensued to its inevitable inconclusion with Shvueli pointing to Facebook and Google as evidence old privacy concerns are going “by the wayside.” Consumers give up privacy in exchange for social connectivity and better searches–might they do the same for mind-blowing gesture-controlled apps? Moreover, PrimeSense will introduce a robust subset of skeleton tracking for the torso only, called the “Upper Body Skeleton.” Many applications don’t require full skeletal tracking but can benefit from using more than a single hand point. PrimeSense is working on bundling the three packages you need to run a Kinect app–OpenNI, NITE, and SensorKinect–into one. Finally, PrimeSense will be porting OpenNI and NITE to Android as well as ARM-architecture devices. These are all really exciting developments for those of us who care. Unfortunately, the PrimeSense crew could still not give a solid answer on some specific and important software licensing questions–namely, mine ; ) For example, PrimeSense has been clear that OpenNI is free and open-source, NITE is free and closed-source, and both can be used that way in commercial applications. Shvueli noted that So Touch Air Presenter is a boxed, commercial app built on OpenNI/NITE. But when I asked if it’s legally okay to package up and re-distribute those libraries with an application so that a user can seamlessy download a single package that does it all, they didn’t know. I pointed out that that’s exactly what So Touch is doing, so, are we good? They’re still just not sure. 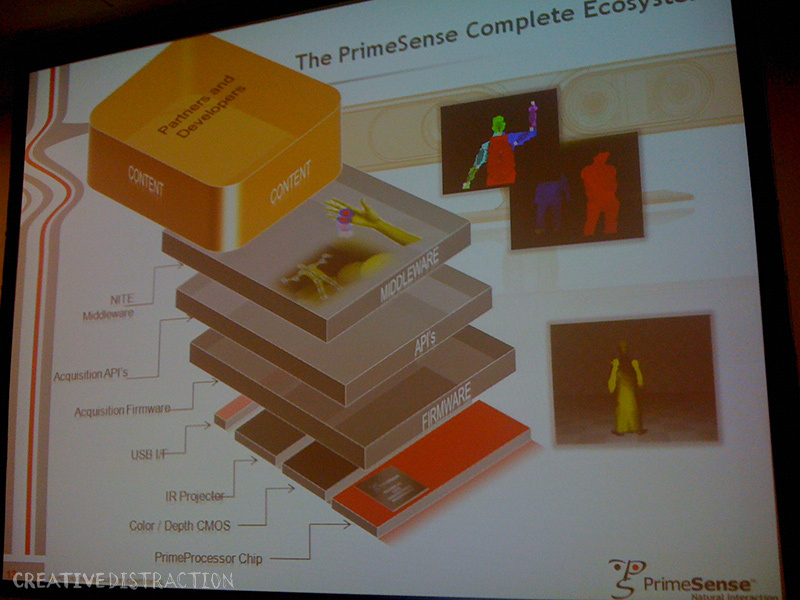 * For those who may not live and breathe this stuff (I do because I’m working on a startup that uses Kinect-like sensors), PrimeSense is the Israeli technology company that licenses the hardware design and chip used in Microsoft’s Kinect. Shortly after the commercial release of the Kinect, PrimeSense open-sourced a software framework for its sensors called OpenNI, which is the abstraction layer on top of the processed sensor data that yields, say, an object representing the user’s hand in space to feed to a game or application. The company also made it’s NITE middleware available as a compiled binary (i.e. closed source), which does the heavy lifting in terms of getting meaningful data (e.g. scenes, skeletons) from the raw “depth map” produced by the sensor.